Collaborative learning is an educational approach that involves students working in groups, or teams, trying to solve a problem, or completing an activity. Working towards a shared common goal, team members are interdependent in terms of their assigned tasks or outcomes, and each team member assumes a distinctive role. The outcomes of a team working together are greater than those possible by any one person working independently (Morgeson et al, 2009; Kozlowsky and Ilgen, 2006). The concept stems from the idea that learning involves interactions with other people and thus is a social process. At the heart of collaborative learning lies active engagement with peers through cooperation and interaction, either in class or online. (Dillenbourg, 2010; Dewey 1938). There is an increasing demand for graduates who possess teamwork skills as necessary for successful integration in the workplace. Collaborative learning provides an opportunity for students to clarify and refine their understanding of concepts through discussion and rehearsal with peers, allowing them to learn from each other and benefiting from activities that require students to articulate and test their knowledge. Group work can also help develop generic skills sought by employers. (James, McInnis, & Devlin, 2002). 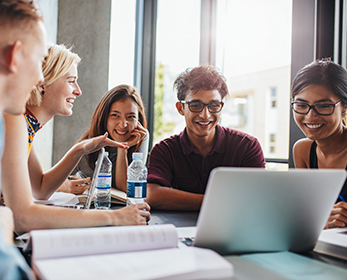 Online collaboration brings additional benefits of flexibility, managing student participation and behaviour, trackability and student autonomy. How can collaborative learning be assessed? Extra and co-curricular activities e.g. volunteering. The aim of these resources is to help you foster collaboration and teamwork in your unit.